WHO ARE THE MISSIONARIES FROM WBC? Wallenstein Bible Chapel is a strong believer in the power of missions and the lasting effect that sharing the Gospel will have with the rest of the world! We are all called to serve in different ways according to our abilities, so WBC is glad to support all of the individuals listed below as they continue to do God's work both locally and abroad! Jessenia Espinoza (Bauman) was born in Ontario, but spent her childhood in the mountains of Mexico where her parents were missionaries (sent out by WBC). After completing her education back in Canada Jessenia felt called to serve in Ecuador. In 2014 Jessenia moved to Guayaquil Ecuador to help support her cousin with the operation of a childsponsorship program at Hope of Bastion School. Since then Jessenia has been actively involved with helping the local church community, youth and running a summer camp for kids. Jessenia and her husband, Raul Espinoza, got married in 2018 and they continue work together at the school (he is the computer teacher and IT man). They are also youth leaders at the local church working to encourage the youth in their faith and hope to be part of raising up spiritual leaders for the future. Phil & Andrea Bauman serve with SIM, based in Ghana, West Africa. Andrea is the Personnel Coordinator and Health Coordinator for the SIM Ghana team. As well as serving the Ghana team, Andrea is the Personnel Coordinator for SIM Middle East. Phil is the Deputy Global Director of Strategic Development for SIM with a focus on helping SIM teams around the world define, plan, resource and evaluate their ministries. Their biggest motivation is to provide an opportunity for those who have never heard the gospel to hear it and respond, and to provide those with the desire to be involved in Global Mission with the opportunity to do so. Jenn is a graduate of Elmira District Secondary School and works on staff at YFC/Youth Unlimited North Perth. She works in the Youth Centre, Campus Life and Impact Leadership Ministries. In addition to her work at YFC, Jenn is also heavily involved with Conestoga Bible Camp and is a part of the leadership team there. Esther is mainly involved with directing the Emmaus Bible correspondence office in Puerto Rico. They have 400 active students, mostly inmates, and in at least 15 institutions. This keeps her in the office 4 days a week. She also helps in her local church with some secretarial work, discipleship among women, and some children’s work. She is actively involved with the camp ministry and specifically as treasurer. Les and Sharon were born and raised in Southern Ontario and were sent out by Wallenstein Bible Chapel in 1973 to serve in Spain. They were involved in church planting and evangelism and have also been active in family life ministries, giving marriage seminars/premarital courses as well as having a burden for leadership training and mentoring. In 2013, Les & Sharon returned from Spain to refocus their ministry in Southern Ontario. They continue to be active in and around WBC as well as helping in Hispanic churches as the Lord opens up doors. 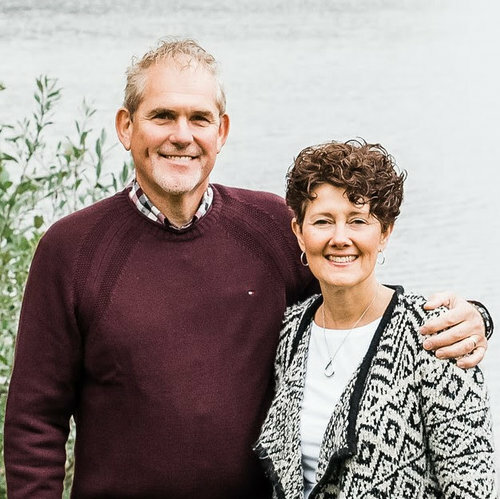 Richard and Marina Haverkamp spent many years serving the Lord in Europe, the United States, and Canada. Together with a few co-workers, 24 churches were established in Belgium. After decades of experiencing the Lord intervene in their lives and the lives of others, Richard was compelled to tell their story in his book The God Who Is Real. It is the Haverkamps’ prayer that all people will discover the unwavering faithfulness of God throughout the joys and struggles of life. Richard and Marina now live in Elmira, Ontario and continue to share the Gospel with everyone they meet. Ray was born in Bedford, England and his wife Carol was born in Dorset but grew up in Cambridge. They have four children plus grandchildren. They were involved with youth work, beach missions and founding a local assembly in England. They served the Lord with New Tribes Mission for 35 years, mainly teaching New Testament Church principles to missionary candidates preparing to reach remote people groups with the Gospel. The last fourteen or fifteen years were as chairman of the NTMC Management Committee. Ray and Carol were commended from Wallenstein Bible Chapel around 1981. Ray is currently Vice Chairman of Guelph Bible Conference Centre, involved in itinerant ministry, shepherding, bible studies and more. Helping others and making missions happen gets Charlotte excited. Charlotte has been been on staff with P2C for over 10 years, and as of September 2018, she is the global missions general manager. Her favourite thing about her job is getting to help lead mission trips. Gord has a passion for evangelism, church-planting, church leadership and church collaboration. His experiences include: Missions in Ecuador and Colombia, evangelism, pastoring and planting in the Kitchener-Waterloo area, the formation of an inter-denominational mission to reach the disadvantaged of the K-W community and he is the founder of Vision Ministries Canada which began in 1992. Gord's present ministry focus is on immigrant churches and international VMC-related projects. He and his wife Heather, live in Waterloo and attend Lincoln Road Chapel. Heather loves people, hospitality and seeing God at work. They have three sons and five grandchildren. Robert and Susan Martin have served the Lord in prison ministry since 1997 in Kingston, Ontario reaching out to men who find themselves in conflict with the law and who have been impacted by the criminal justice system. There are six federal institutions in this area and ministry opportunities include assisting chaplains with chapel services, visiting one-on-one, facilitating weekly group Bible studies and other chapel programs, and escorting eligible inmates to church on the street each Sunday. Russ & Meredith serve on the Power to Change Global Digital Strategies team based in Singapore. They are focused on helping indigenous leaders in 26 countries effectively use digital strategies to help people discover Jesus. Many of these locations are the least reached or hardest to reach places on earth for the gospel. Today, 70% of the world’s population have a mobile phone and Russ & Meredith lead a team that helps makes sure that the gospel can be presented in a relevant way to every tribe, tongue and touchscreen. Russ grew up at WBC and attended the University of Waterloo, studying computer science. Meredith is from Haliburton, ON and studied studio art at the University of Guelph. Russ and Meredith have 3 children, Wyatt (7), Gwenyth (5), and Heath (3). Trevor and Hannah Martin help to engage university/college students with the gospel and help Christian students to grow and multiply their faith. Their goal is to be a part of fulfilling the Great Commission by making disciples of Jesus who make more disciples. Currently, they oversee the ministry of Power to Change on seven campuses in Southwestern Ontario. Along with their team, their focus is discipling, coaching and supporting the student leaders of the ministries on these campuses as well as equipping students to share their faith. Trevor grew up attending WBC and is from Waterloo while Hannah is from the Toronto area. They currently live with their daughter Amelia in Waterloo.